The author of the poetry collection Cruise Missile Liberals takes the CBC Books Magic 8 Q&A. 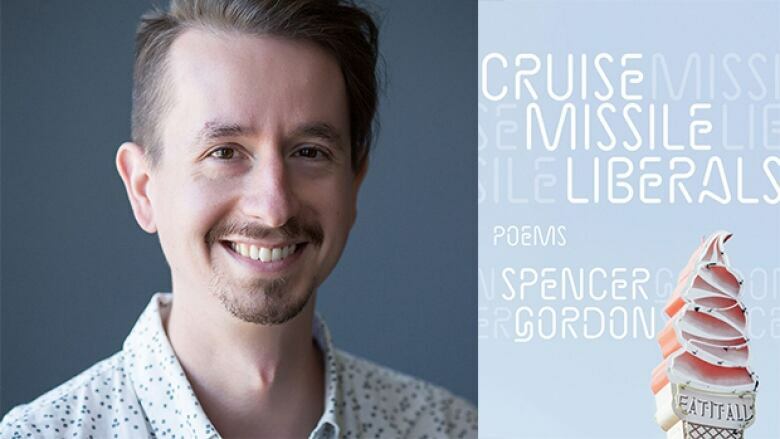 Spencer Gordon's debut poetry collection Cruise Missile Liberals smacks around words, concepts and narratives in a playful and irreverent manner. Gordon, who is also the author of the short story collection Cosmo, was named one of CBC Books' writers to watch in 2012. Below, he takes the CBC Books Magic 8 Q&A and answers eight questions from eight fellow authors. 1. Shani Mootoo asks, "What was the best surprise you had in the process of writing your latest published book?" The first surprise was that my poems arrived in a full-length collection, period. I assumed I'd write chapbooks and release small poetic emissions until I was dead, and that my next book was maybe going to be my novel-in-progress. Strange things happen to your writing, if you let them. This entire process is a surprise. And surprises continue since the book was printed. This interview is a surprise. That people would want to publish a collection of my poetry? Whoa. That authors I admire would be willing to write endorsements of the manuscript? That I could read the finished book — cover to cover — and not die of shame? I'm blown away. 2. Nick Cutter asks, "How much of your fiction have you mined from your own life? If so, has it ever gotten you in trouble?" I've mined my own life for everything I've ever written and published. But so far, personal details about my own grubby grind haven't gotten me into trouble. Trouble with whom? God? Trump? My overseers? Zorro-mask wearing enemies? I mean, I guess I'm lucky. I'm an unknown mole writing poems. Who cares? 3. Cea Sunrise Person asks, "What's your biggest fear when a new book is released?" My biggest (but most absurd!) fear is going to come true: that my books are on the fast track to the void. Part of becoming a wiser, happier and more mature artist is facing this fear, accepting what it means. You have to breathe into irrelevance. Watching what you create go from pure potentiality into an object only a handful of people read or remember is instructive and redeeming and liberating. I'm serious. 4. Scaachi Koul asks, "Is there any piece of writing you wrote in your past that you now regret?" I'm a bit Gemini on this issue. On the one hand, I regret nearly everything. It's all a sliding scale from "Somewhat" to "Extremely." I mean even the things I'm most confident about contain at least one nugget I'd love to amend, given another look — or a few years. I suppose you could call that brand of insecurity "regret." I have a small fleet of chapbooks, anthologies and magazines containing my early work, and nearly all of it makes me cringe. But then again, let's be realistic! I'm not headed toward the bestsellers list or canonization. So thrust up against oblivion, I feel as though spending too much emotional energy on literary regret during these precious days — and all over ephemeral wisps of ink or HTML — is anything but healthy. I'd rather regret the hours I've spent watching Kids Who Kill on Netflix. As Drake said, you only live once. 5. Durga Chew-Bose asks, "If you could have any view just outside the room where you write, what would it be?" There's no one room where I write, so the view's always changing. That's okay. I think if I had to choose a view, it would be overlooking a metropolis, so high in the air as to be touching the clouds, revealing the curvature of the Earth. This would inspire me to be dreamy and dizzy and brave, as remote as a monk and full of tenderness for all the tiny frustrations below. 6. Hoa Nguyen asks, "What is your writing area or desk like? Please share a description." I don't have a designated writing area or desk. I write at my dining room table or at my office desk at work or on a laptop somewhere public, when I feel courageous. My desk at work is cluttered with files, coffee mugs, water glasses, Post-It notes, a tiny globe, a mummified slice of tangerine that we named "Bean," business cards, a box of Kleenex, pens and earbuds and paper clips and crumbs. I wouldn't mind surrounding myself with beauty in a purified space — or a Walden Pond — but I don't really know how to do that. I feel out of control. 7. Rajiv Surendra asks, "Do you have any major turn-offs associated with writing?" Everything turns me off about writing. It's a total bummer. It hurts and makes me hate my mind — a margarine container filled with cliched worms. Given a choice between writing and doing just about anything else — eating, dancing, exercising, reading, humming, plucking, wobbling, shrieking, crying (or just about any other gerund you can think of) —and the answer's obvious. But writing is like taking out the trash. My life's going to stink if I don't do it. I also have to remind myself that the pure act of writing is often more joyous than I give it credit. It's only when I remember myself while writing, or think of the world of books and writers, "community," that things start getting derailed and depressed. I'm starting to see art as the third pillar of my little existence. I need physical exercise and fresh food to keep my body happy. I need meditation (or some kind of spiritual practice) to keep my mind happy. And I need writing, art, to keep my heart beating. 8. Vivek Shraya asks, "Who is a Canadian writer you aspire to write like and why?" How about Céline Dion? I choose her for her unwavering belief in the power of love.